Farmer Sergei Semenov is only one of the few people who witnessed the Tunguska event on June 30, 1908, and survived. At the time of explosion, he was having a breakfast in trade station of Vanovara, located approximately 40 miles from the epicentre. What actually happened on that day? Early in the morning, on Tuesday 30.th of June 1908, there was a massive explosion in the area of Podkamennaya Tunguska, an unprecedented event uncomparable to anything in our modern history. Closest seismograph, installed in Irkutsk, 600 miles from the epicentre, recorded strong vibrations lasting more than 60 minutes. Sound wave caused by the event encircled the planet multiple times. More than 800 kilometers away, in the city of Kansk, the noise was so loud that a train engineer stopped his train, thinking that one of the freight cars had exploded, and about 800 square miles of forests were flattened by the shockwave. However, any remnants of the object which caused this event are yet to be found. 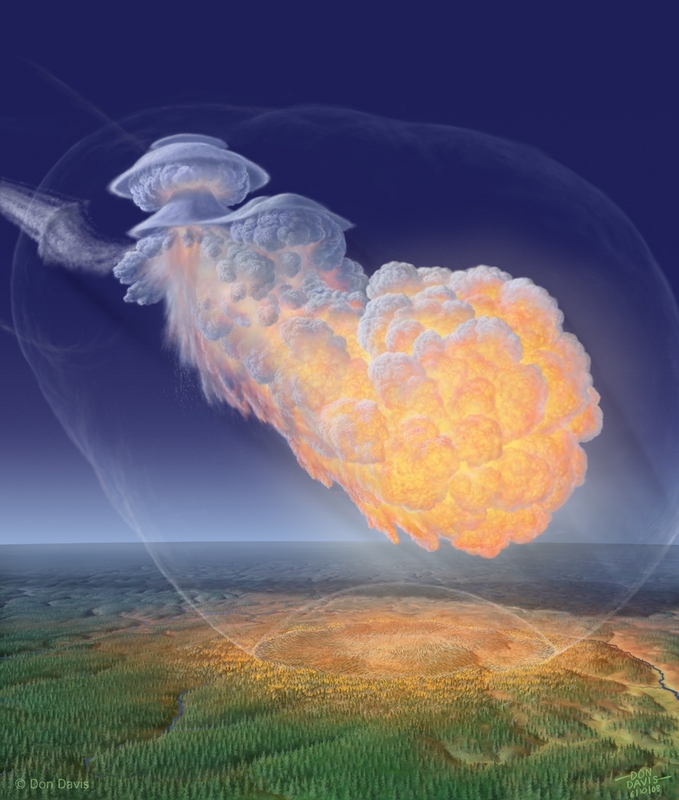 According to the widely accepted theory, Tunguska event was caused by an asteroid air-burst on a grandiose scale(similar to 2013 Chelyabinsk event), which produced more than 30 megatons of energy. Both existing evidence and majority of scientists support this theory, however, soon after the explosion, incredible amount of other theories appeared, trying to explain the true nature of the Tunguska event. They range from scientifically based theories, supported by solid evidence, to various irrational hypotheses, often fabricated just to get attention. Let’s explore some of the other theories about the Tunguska Event, from scientific to plain ridiculous, and find out what really exploded in Siberia in year 1908. ”Mathematical models indicate, that Tunguska event was actually caused by an explosion of small comet”, Moscow University professor Samuel Grigoryan claimed in year 1976.”Core of the comet is composed of frozen gasses, ice and cosmic dust. During its passage through the atmosphere, it would be rapidly heated, causing immediate evaporation and explosion. Released energy would correspond to the estimated 40 megatons”. Although this theory, first suggested in 1930 by British meteorologist Francis Whipple, explains the strange luminous phenomena observed by the eyewitnesses of the Tunguska event, majority of scientists consider it being very improbable. They often point out that a fragile cometary body ought to have already disintegrated in the uppermost layers of the atmosphere, whilst the object that caused the event apparently remained intact until it reached the lower atmospheric layers. According to many so-called ”experts”, Tunguska explosion was supposedly caused by annihilation, physical process that occurs when a subatomic particle collides with its respective antiparticle of the opposite charge, producing immense amounts of energy. According to this theory, first suggested in year 1941 by Lincoln LaPaz, the Tunguska event was likely caused by the annihilation of a chunk of antimatter colliding with Earth. Although the antimatter theory explains the observed luminous phenomena, and why no remnants of asteroid or comet were found in the area, existence of such large antimatter chunks is often deemed being teoretically impossible. In addition, annihilation of the alleged chunk of antimatter would probably happen in the uppermost atmospheric levels. Did a miniature black hole really cause the Tunguska event? Another speculative hypothesis suggests, that the 1908 Siberian explosion was caused by a small black hole passing through Earth. This hypothesis was first formulated in year 1973 by American scientists Albert A. Jackson and Michael P. Ryan. However, as there was no exit event(second explosion, occuring as the black hole shot out in the North Atlantic), this hypothesis is considered wrong by majority of modern scientists. Other evidence, as dust trails and high-nickel concentrations around the impact area also dismiss this hypothesis. Akulina, an Evenki woman, who was closer than 20 miles to epicentre at the time of explosion, later reported the event to the scientists: ”A mighty wind flattened our tent, while we had been sleeping. A brilliant ourburst of light blinded us, the wind was breaking trees like they were sticks. As a rising whirlwind lifted us off the ground, I lost conciousness”. After she woke up, she remembers seeking her husband, Ivan, being lifted up by blast, and slammed into one of the remaining upright trees, 130 feet from the remnants of the camp they had slept in. He died few hours later from fractures, shock and blood loss. ”Our reindeers also vanished, and we haven’t found them since”, Akulina also reported. If we can believe shamans of the Evenki tribe, who lived in the area for thousands of years, Tunguska event was caused by the Agda, the God of Thunder himself. Dissatisfied by the tribal disputes, Agda reputedly sent ”demons with shining eyes and fiery tails”, to punish the disobedient Evenki men. Of course, we can’t take this explanation seriously. 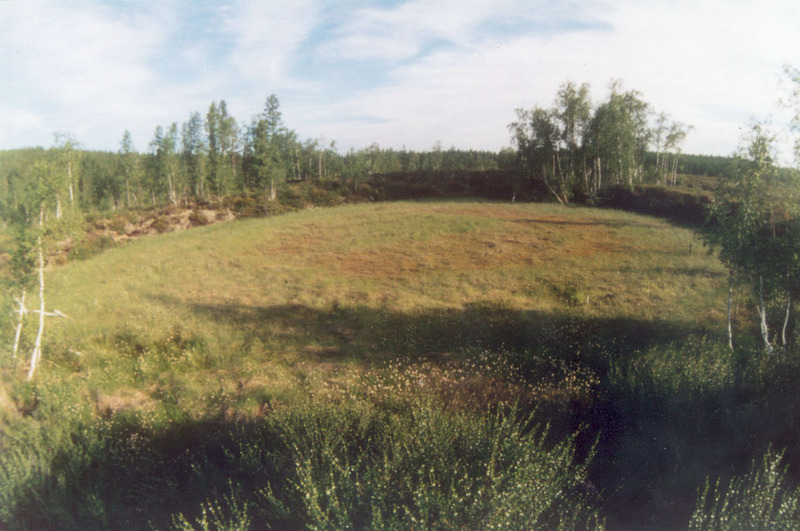 However, the fact remains that immediately after the event, the area was declared sacred and forbidden zone by Evenki tribesmen, who then reportedly expelled or killed dozens of Soviet scientific expeditions that ventured into the area of explosion decades after. In year 1956, Russian sci-fi writer Alexander Kazancev published his short novel titled ”The Explosion”, with his own explanation about the true cause of the explosion. According to his version of the story, the Tunguska event was caused by the massive nuclear explosion of an extraterrestrial spaceship. In year 1945, eleven years before the published the famous story, Kazantsev visited the ruins of the Hiroshima, city devastated by a nuclear explosion. Near the explosion’s epicenter, he noticed still-standing trees, with their leaves and branches ripped off by the sheer force of pressure wave. 6 years later, during his visit to Tunguska, he noticed similar patterns; no crater and standing trees without any branches or leaves. Because of that, he quickly comes to a conclusion; 1908 event had to be caused by a massive explosion, probably of nuclear origin. Another thing supporting the nuclear explosion theory are the burn marks on all trees around the epicenter. 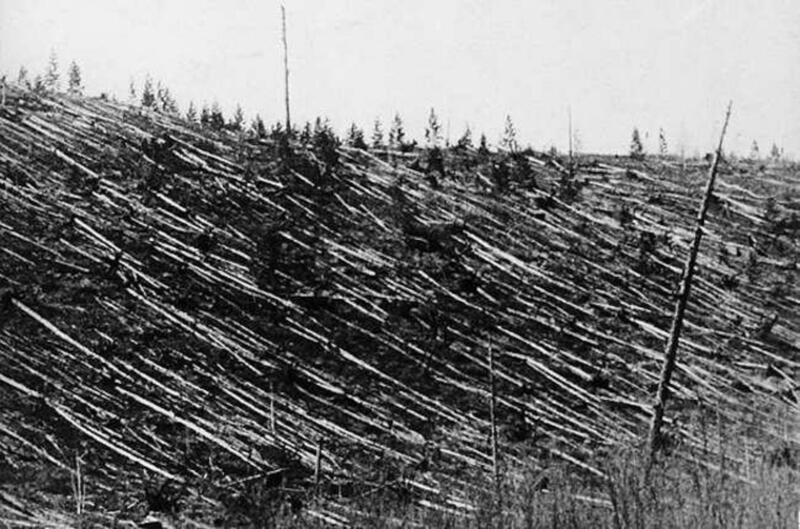 Forest fire caused by meteor explosion would burn the trees all around, however, marks only on one side indicate concentrated, short-term radiation heat, as during a nuclear explosion.